It has been really encouraging to receive responses indicating the desire to take definitive action decarbonising our electricity supply, and the need for a vehicle to do this. So far I have kept content coming your way, but I promised more than a talk-fest. 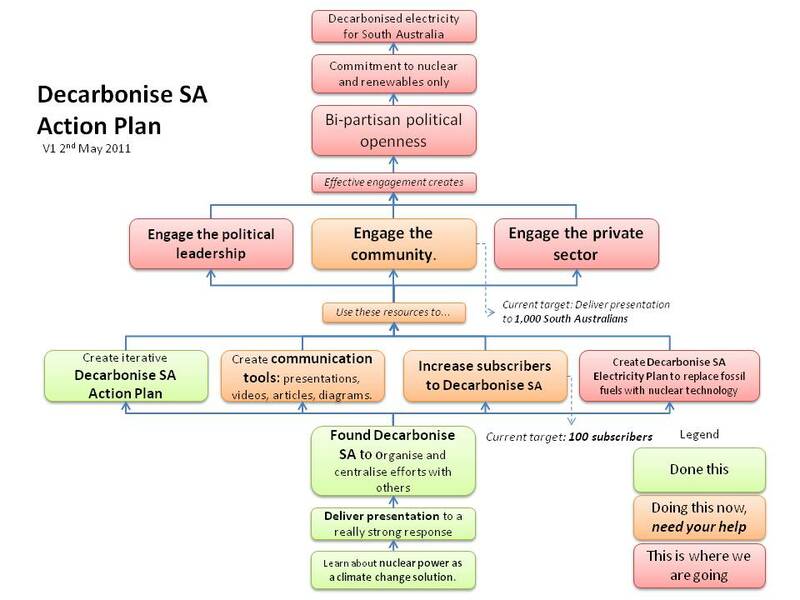 So I’m pleased to post version 1 of the Decarbonise SA Action Plan. The Action Plan is to serve as the guiding framework for Decarbonise SA. It is to ensure that we always understand what we are doing and why, and that what we are doing is helping to move us further along this plan towards our goal. I built the plan using the simple technique called backcasting. You just go to your desired destination, and work backwards from there to your present situation. I think I have mentioned that diagrams are not really my strong suit. If anyone wants to make something more attractive of this, I would be most grateful. It should be evident that the further into the future the plan goes, the more general are the stepping stones. I look forward to updating the plan, showing the progress, and fleshing out those steps as the pathway becomes more apparent. For now though, I think this is a useful start; I know I feel stronger having finally got it out of my head and onto the screen. I’m happy to admit that this plan is simple. I don’t think that’s a bad thing. For one thing, it can and will be improved as we move forward. I am a big believer in putting work out to the world rather than hiding behind perfectionism (hence the v1). But to be honest, some of what we have to achieve is simple. The message I have had from the political leadership is simple. The presentation I have been giving works, and works well, at either changing people’s perspective altogether or convincing them that perhaps the issue needs more thought. That’s not complicated. Change enough minds in the community and bring the political leaders along with you, and the rest should follow. It should also be evident that Decarbonise SA is in its building phase. We need to build subscribers and resources; that’s what is in orange right now. I have a successful presentation and I am pursuing audiences for it around the state; hence the community engagement phase is active. I don’t want to consider the political and private sector engagement truly active until the process of creating the Decarbonise SA Electricity Plan is at least under way in its early versions and until there is a little more subscriber mass behind Decarbonise SA. So they are in red. This week and next I will be commencing work on a couple of videos, and making my first post to serve as the beginning of the Decarbonise SA Electricity Plan. With a bit of hard work, I should have the confidence to turn a couple more boxes green as these things get done. As ever, stay tuned, and visit the How to help page if you want to make a contribution to the efforts.